The Verb Hotel's common area, where guests can peruse records for use in their individual rooms. There are certain places—show-stopping hotels, award-winning restaurants, local dive bars, or incomparable vintage shops—that are worth planning your whole trip around. The Verb Hotel in Boston, Massachusettes, is one of those places. 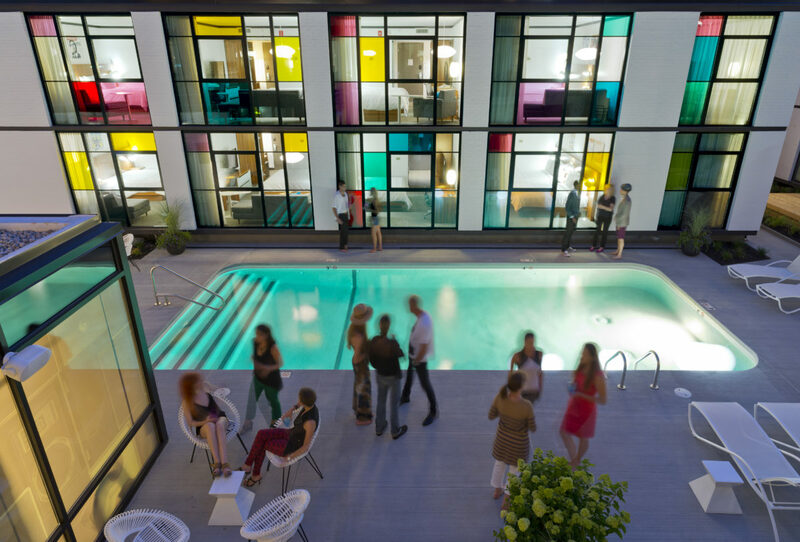 Bordering Boston’s famed Fenway Park, The Verb is a boutique hotel designed to celebrate the area’s historic (though often overlooked) past as a hub for art and music. 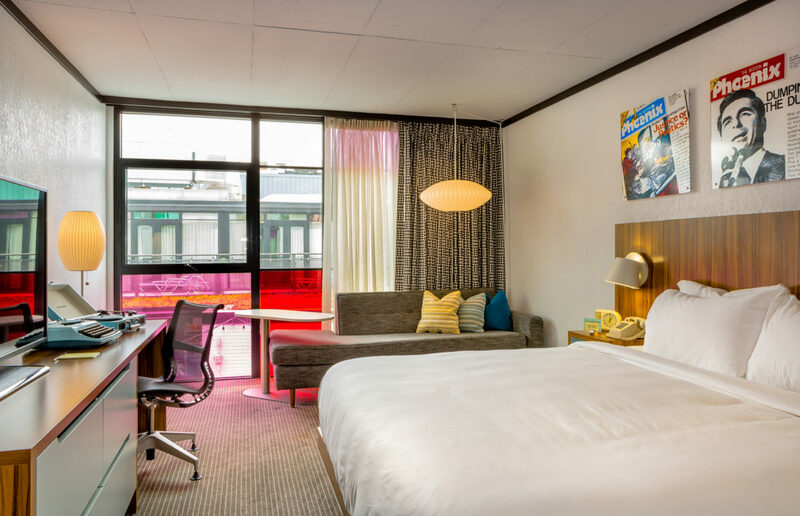 Housed in a restored motel that opened in the 1950s as the Fenway Motor Hotel, The Verb is attention-grabbing at first sight with colourful pop-art-eque windows, a vintage red bus permanently parked outside, and a buzzing atmosphere that spills out the doors. Spaces are decorated with cheeky quotes like, “If the music is too loud, you’re too old,” and filled with a mix of mid-century furniture and kitschy rock memorabilia (think vintage concert posters, jukeboxes, electric guitars, and amps). Each of the 94 bedrooms is equipped with a record player and a starter selection of vinyls—for more options, guests can peruse the hotel’s record library (which caters to wide-ranging musical tastes) and take whatever they’re drawn to enjoy for the duration of their stay. The Pool Deck at night. Why it’s worth the trip: The hotel doubles as a well-located base for exploring Boston and a space ripe for exploration in its own right. Behind the curation of rare music artifacts on display is a team of qualified artists, archivists, and “vibe conservators,” and hotel staff always have listening recommendations on hand. Hojoko, the oft booked-out neighboring bar/restaurant that is separated from the lobby by a sliding door always has something fun going on, be it karaoke or live music. You’ll like it here if: You’re looking for a good time! In line with its rock-and-roll theme, the hotel can be loud and lively into the early hours of the morning (especially on Friday and Saturday nights) which is an indication of all the fun to be had onsite. Price breakdown: Rates start at a reasonable $125/night and include a to-go breakfast. A standard room overlooking the pool at The Verb Hotel. The crowd: Young and fun—the Verb is definitely not a business hotel. How to prepare: Don’t forget a swimsuit—a very well-heated salt water pool in the courtyard is open year-round. Pro tips: Make sure to have a meal (or multiple) at Hojoko, an izakaya restaurant attached to the hotel that serves what must be the best Japanese-fusion in the city. While you’re in the area: Check out the hallowed home of the Boston Red Sox, and enjoy the best bread pudding (with butterscotch and salted caramel!) at nearby brasserie Eastern Standard. Also in walking distance is the Isabella Stewart Gardner Museum, which houses a wide-ranging private art collection spanning Roman mosaics to 20th century paintings. You also won’t want to miss Wally’s Jazz Club, which features live music every night of the year.